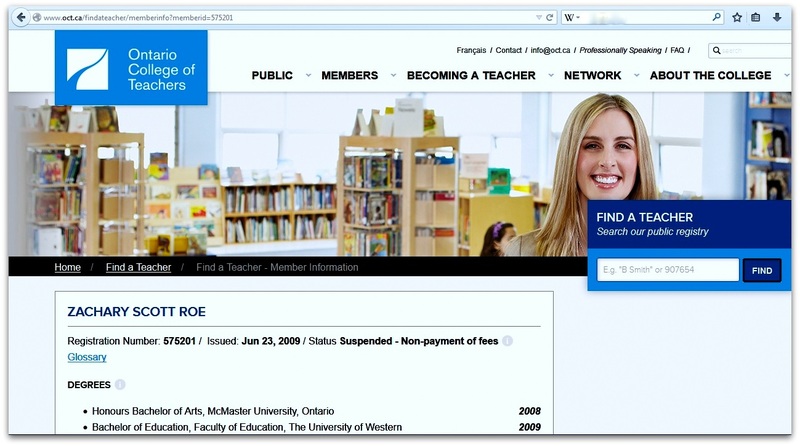 Once upon a time I was a certified teacher in the province of Ontario. I’ve now been officially suspended. As of April 30th, I can no longer teach in any publicly funded school. No, the reasons for my suspension were not nefarious, nor were they illegal. After four years and over six-hundred dollars to maintain my official “Certified Teacher” status, I finally said enough is enough, because while I had been a certified teacher for over four years, I had been an employed one for exactly . . . well, never. The proof. On the up side, I save $140 / year. Boo-ya! This is a failure. Clearly. Every time someone sees me and asks why I’m not teaching, I can see it in their eyes. I give them perfectly rational explanations for my not being able to get a teaching job, such as the severe competitive nature of new teachers, the imbalanced ratio of new teachers to actual teaching jobs (somewhere between 2:1 and 4:1, which explains the aforementioned competitive nature), and just good old fashioned bad luck. But every time I offer these explanations, I am met not with pity but with disbelief. They don’t believe me. Not a one of them. So it’s clearly a failure on my part. It’s been four years, yet people are still asking me. So let me be clear: stop asking. I am not nor will I ever be a teacher. That ship has sailed and has been lost at sea. Everyone on board is dead. I know. Because I killed them. ALL OF THEM. But doesn’t it bother me that I make considerably less now than I would have as a teacher? Yes. Obviously. And don’t I realize that those people asking are just trying to make small talk, and don’t I also know that I’m not always the easiest person to engage in conversation? Yes, I know that, too. Then why am I being such a prick about all this? The short answer is that I’m tired of being polite, especially when the person asking has already asked and been given an answer only weeks previous. But also, and more importantly, I think it’s important to make things official: Zac Roe is a failed teacher. After high school, I went to school for six years and earned two degrees and have done exactly nothing with either of them. I tried, I really did, but an English degree has never been a golden ticket, and I should have known better. But I didn’t. And then I couldn’t make it as a teacher. Now I’m a blue collar worker making five grand less a year than a new teacher earns at the beginning of their career. And I’ve been in my industry for twelve years. I have no one to blame expect myself . . . and maybe bad luck. Now that I’ve said my piece, let’s move on. In the years since graduating with my degree in Education, I have learned the valuable practice of living in the present. This popular expression – to live in the present – is an old horse that gets trotted out on the regular, but I’ve discovered that its purpose is not derived from a sense of optimism, but from an understanding that to dwell for too long on the hardships of the past or the uncertainties of the future will lead only to a lot of pity parties and fashionable depression. So I live in the present, which is to say I live day by day. This sounds depressing, but it doesn’t have to be. There are many joys in the little moments of each day, be it as simple as a good cup of tea or a lazy afternoon nap. Here’s the hard truth: life is just life. If you want to believe that each of us has a divinely prescribed purpose, then knock yourself out, but I’d prefer to avoid such fairy tales. Yes, once upon a time I was a teacher, I had high and fantastical expectations for my life, and I anticipated a lifetime of happily ever afters (not to mention a good salary with sick days, a killer pension, and the summers off). But then I had to grow up, and then own up to who I actually am. I am Zac Roe and I am not a teacher. « Writing a Novel — What a Joke!